“Snowball Express started in early 2006 with a simple idea: provide hope and new memories to the children of military fallen heroes who have died while on active duty since 9/11. America should honor and pay tribute to the children of those military fallen heroes who have died while honorably serving since 9/11. In December of 2006, nearly 900 family members from all across America and the world gathered in Southern California for an unforgettable holiday gathering. Kids and widows discovered they weren't alone. And they found they weren't forgotten. 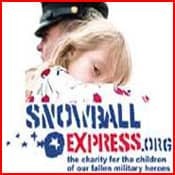 Since 2006, Snowball Express has partnered with such sponsors like American Airlines, Oakley, and BP Express (just to name a few) to throw an annual gathering for the children of our nation’s fallen soldiers. American Airlines has become the "Official Airline of Snowball Express", with six aircraft donated to provide all-expenses paid travel for the families. AdvantEdge is thrilled to join Snowball’s mission and will match up to the first $2,000 donated. Once we have tallied our total pool, we’ll then send the cumulative donation to Snowball Express after our annual holiday party. 2) By donating through AdvantEdge, i.e. adding to our pool of donations via cash or check (made out to Snowball Express, Inc.). You can also request a donation to be added to your December 2012 invoice as a convenient alternative to cash/check. Whether you personally have lost a loved one in combat, know someone who has lost a family member in the military, or just feel strongly about Snowball’s cause, this is an opportunity to honor our fallen veterans while making a difference for their children. So please donate today! For more information about Snowball Express, visit www.snowballexpress.org or contact them directly at info@snowballexpress.org. Networking During the Holidays - Step out of the Office!